So, we recently got rid of Netflix and Hulu. There’s just so much junk on the two apps and I realized that it was my coping mechanism. It’s never fun to see your shortcomings, and this decision has been a long time coming. I just didn’t want to admit it. When I’m stressed, I turn a show on, when I’m angry I turn a show on, when I’m upset, or happy, or sad, I turn a show on all in the name of self-care or tunning out. But wasting my brain in front of the screen is absolutely not self-care. It’s much the opposite. So, I traded Netflix and Hulu for educational YouTube and podcasts. And I’ve significantly cut down on how much screen time I get. It’s funny that I have a 30-minute limit on my children per day, but I have no limit on myself! I can honestly say the same about sugar too. But I digress. I recently started listening to Chris Hogan. He is one of Dave Ramsey’s protegees who deals mainly in retirement but echoes Dave Ramsey’s baby steps in financial planning methods. I never really thought much about retirement because frankly my husband’s military and that aspect is just kind of part of the job. But, because he’s National Guard their retirement works a little different and so I set up a retirement account ages ago putting a little bit in every month to supplement the time between he retires and when he can draw from is military retirement if certain parameters are met. In listening to many of Chris Hogan’s podcast and YouTube videos I realize retirement is probably something I need to work a little bit more on! But again, that’s not the main point of this post. I started reading Hogan’s book called Retire Inspired. In the forward Dave Ramsey walks through his baby steps again. Now I could quote these to you I could give you a detailed summary on every single step. Dave Ramsey is basically my spirit animal. But I got stuck on the step where you’re supposed to invest in your kids’ college. 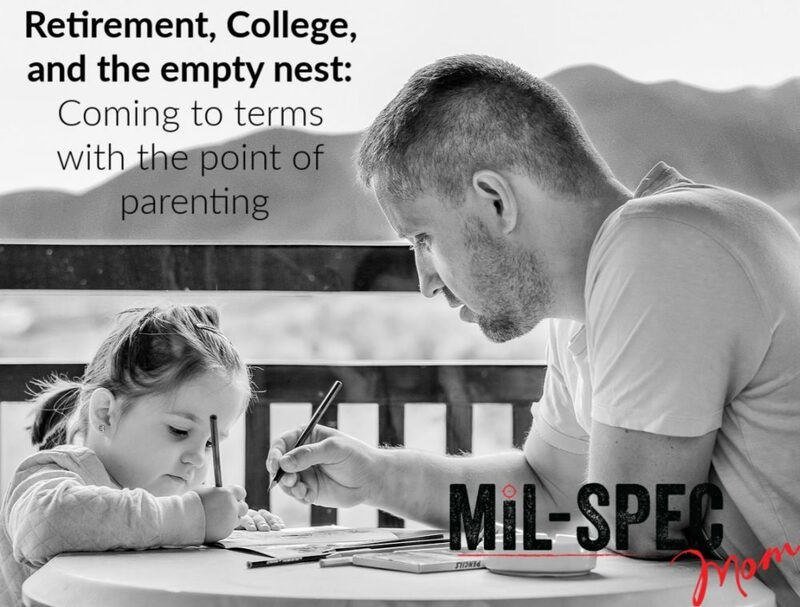 A part of us always assumes that our kids will join the active duty military or the national card like my husband and get their college paid for and go on with life without any or many student loans. I started calculating how much we would have by the time my oldest son turned 18. He turns 9 next month and so we have 9 years and at 12 months in a year, I calculated that I have 108 months left with him. I was nursing my youngest when I was doing these calculations on my phone. The number hit me. I don’t know why but I expected to see four or five digits in the months that I had left with him before college. Surely, my calculations were wrong! Surely, I’d multiplied or divided something incorrectly. But no that’s not the way this works. I have 108 months left before he grows into the man that God wants him to be and he leaves to start a life of his own. We have 108 months left to raise him to be a good man and to raise him into the competent adult that the world is missing so much of lately. We have 108 months to make him a kind, yet strong, man of God. I posted something on my personal Facebook a couple weeks ago about this little dude. He’s my firstborn. I had him when I was very young. Not age-wise, because I was 23, but mentally and emotionally. I haven’t grown up yet, I hadn’t seen that side of life. I was still living in the post-college era lifestyle with no responsibilities. Turns out birth control is a huge responsibility. One that I did not take very seriously with that relationship that epically failed. This kid is special to me. Not more special than my other children by in many ways this little guy and I grew up together. We learned what it was to be a parent and a child and not co-people. We learned what it was to resolve arguments. He knows my soul, he sees the tired by my smile, and he’s aware of it because he knows me. We lived alone, just he and I, for a long time, and the thought of him leaving in 108 months moved me to tears. Not just quietly running down my cheek as I stare at the number on the screen but sobs. My first thought was that’s not enough time! That’s not enough years left. I want him to stay my little boy a little longer! Surely, he’s not ready to go into the world. He’s too kind and gentle; he’ll get eaten alive! But then I realized that’s my job (our job) as a parent to mold him into someone who can take on the world. This is exactly why the Lord blessed us with this amazing old-soul of a child. It’s our duty to protect him, to nurture him, to guide him, and most importantly, to show him the path to Christ so he can emulate the Father in all he does. How many months do you have left with your kiddos before they’re adults and go off to start the adventure that the Lord has planned for them?